Who’s Responsible in a School Bus Accident? Getting children to and from school safely is a major concern of every parent, especially if the child is transported on a school bus. However, car accidents happen every day, and some unavoidably include school buses filled with children. As much as automotive safety technology has advanced in recent years, buses are not particularly safe for passengers, and accidents involving these vehicles frequently result in serious injury and death. Parents of children injured in an accident on a school bus are understandably concerned with learning what happened, and who is responsible for the harm experienced by their child. The parents of a 6-year-old girl killed in a school bus accident in Houston are suing the driver and school district, claiming the driver was reckless and negligent when she entered a curve too fast and caused the bus to roll onto its side. Many different actors can hold potential legal liability in these situations, and figuring out the appropriate amount of damages for a child is often more complicated, as there may be additional unknown factors. 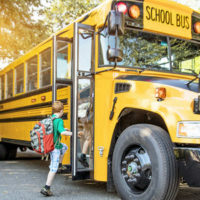 A discussion of possible parties in a lawsuit for a school bus injury, and a breakdown of the damages a family may receive for harm inflicted, will follow below. To win a personal injury lawsuit for negligent or reckless conduct, the injured party must prove the defendant was at fault for the accident. Generally, all drivers have a duty to operate their vehicles in a safe and reasonable manner while on the road, but school bus drivers have a higher duty to protect the safety of the children on board, which requires they use extra care when transporting children. Negligence occurs when one breaches this duty of care and causes an injury. While the bus driver is the obvious person to hold responsible, other entities also typically share liability, including the school district, third-party contracting agencies, and insurance companies. The contracts and policies a school district has in place for the transportation of children on government-approved vehicles will determine which additional parties can be brought into the lawsuit. Most school bus drivers are independent contractors hired through third-party agencies, which have a duty to properly vet each driver for issues that could compromise his/her ability to safely transport children. Analyzing whether a breach occurred usually involves looking at the standards that govern inspections, driver training, and the licensing of the driver to see if violations occurred. Additionally, school districts are not typically allowed to delegate responsibility for the safe transport of children to a third party, and remain liable if the third party contractor failed to use reasonable care when selecting a competent driver. if the child died, funeral expenses and the value of the child’s life, which measures life expectancy, earning potential, and circumstances of those claiming the loss – these numbers are unavoidably speculative, so working with an experienced car accident attorney is central to getting a fair result. Accidents happen, but the responsible party should not be able to escape liability if he/she acted negligently. The attorneys at the Miami law firm of Pita Weber Del Prado understand the anguish your family faces in these situations, and will fight to get you the compensation you deserve. Contact us for a free consultation.